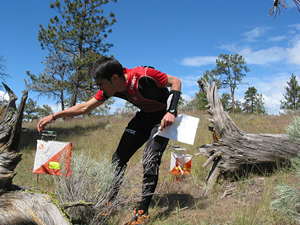 Orienteering can be described as a sport or recreational activity in which the orienteer uses a map and compass to navigate quickly from point to point in unfamiliar terrain. When used as a competitive activity, it is a timed event in which the challenge is to move as fast as possible to collect a series of pre-determined checkpoints (known as controls) in the shortest amount of time. To identify the checkpoints (controls), an orange and white control flag is used. Once you have found the control flag, you will record that you have visited the correct control by either using a manual punch or electronic timing device. Local orienteering clubs put on regular events in parks, wilderness and even urban areas throughout the year. At these events, you will find several orienteering courses designed to challenge anyone from recreational enthusiast to competitive orienteer. 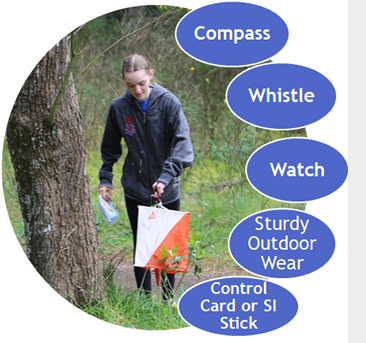 Please explore the links below for an overview of the components of orienteering. 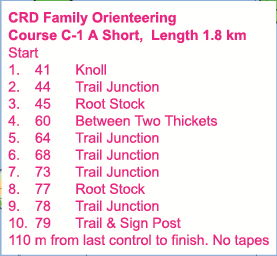 At the start of the competition the orienteer is provided with an orienteering map, and a control description. An orienteering map is a very detailed map that will identify the start (red triangle), finish (double circle) and the location of the control points (circles) which need to be found. Orienteering maps are drawn at a fairly large scale to make the map easy to read for navigation on foot and will include information such as trails, cliffs, rocks, water features, hills etc that will be of use to the orienteer to identify their precise location. Common map scales are 1:7500 and 1:10000. For more precise detail maps at a scale of 1:2500 or 1:5000 could also be used. A control description is included either separately or attached to the map. Control descriptions are used to describe the mapped feature (such as a rock, fence corner or path junction) to be located and the details as to where the control flag may be located in relationship to this feature. On beginner courses, these descriptions are available in plain language. At more advanced courses, the description sheets are provided using IOF symbols which will be introduced in a later section. Compass - you may not need a compass for the beginner courses, but it will be helpful for orienting your map to north. On advanced courses, following a compass bearings may become important. Whistle - A good loud whistle is used as a safety device to allow you to summon aid in the event of injury. Watch - It is very important to keep track of the time you are on your course, so that you will be able to return to the finish before the course closure time. Sturdy Outdoor Wear - Sturdy outdoor athletic shoes are highly recommended along with long pants to protect legs from underbrush. Control Card or SportIdent Stick - To confirm your visit to the right control flag a control card is used. Increasingly a new electronic timing system called SportIdent is used to record your visit. More details on this in the next section.